Poor Kevin Magnussen. After being strung along for far too long at the end of last year by the McLaren Formula One team, he was finally hired as a test driver for 2015. McLaren not only passed on the option to renew his contract for 2016, but the team principal’s assistant let him know via email on his birthday. When the date of McLaren’s option on me passed, I was kind of waiting to hear from them. I didn’t hear anything for a few days, and then, after about a week, when I saw an email from [team principal] Ron [Dennis]’s personal assistant Justine [Bowen] in my inbox, I had an idea of what it might be. It was a short paragraph explaining that there would be nothing for me in the future. It arrived on my birthday, actually. Wow. I have no words, just wow. I mean, it’s poor form not to announce this kind of thing face-to-face. It’s even worse to shuffle it onto an assistant to write. Worst of all, it’s triply insulting for it to be sent on the recipient’s birthday. Shouldn’t that sort of thing be on a calendar somewhere? Besides, at least they’re letting him know about their plans for next year in October instead of December this time. Look, I’d already made it clear that I was 100 percent determined to race next year, and obviously McLaren already have two contracted race drivers for next year in Jenson and Fernando. So, well, three into two won’t go, will it? I was only ever going to have a chance of a McLaren race drive in 2016 if one of them was going to retire or whatever, and that’s probably not now going to happen, so it was pretty clear that there was going to be no room for me at McLaren. 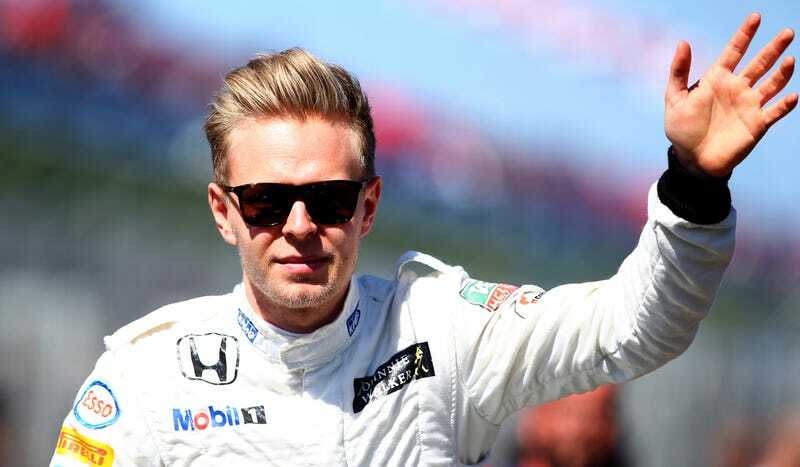 While Magnussen described this year as “frustrating” due to the lack of race time, he also says that there are a lot of people at McLaren that he’ll miss and that this year taught him a lot about the engineering side of F1. Button and Dennis, too, have both been very complimentary of the young driver’s skills lately. Who might be replacing Magnussen, then? Perhaps McLaren development driver Stoffel Vandoorne will step into the role, as he won the GP2 Championship this year, but part of me hopes Vandoorne will move into a full F1 drive somewhere after that kind of a performance. Maybe he’ll even find a team that doesn’t can drivers via email. So, where will Magnussen go? His debut race with McLaren ended in a second place finish, so he’s no slouch, either. He still wants to stay in F1, and told Motorsport.com that he’s been in talks with several teams lately. Unfortunately, with so few seats being shuffled around, there aren’t many places for him to land. If the worst case scenario happens, though, Magnussen insists that there are opportunities outside of F1 for him to still race. An F1 drive is still clearly Magnussen’s goal, though. #NeverGiveUpOnTheDream, dude.